CHAW is a very special place. There is so much to tell about its history, the people who worked hard to bring it into existence, and those who have and do work to keep it that way. There’s the wonderful community at CHAW, drawing from Capitol Hill and beyond. There are the brilliant artists from every discipline imaginable who work to awaken latent creativity or provide direction for those already burning bright. So much to tell; but today I’m going to talk about . . . me! Well, my connection with CHAW and why it means so much to me. Way back in the late 1990s, a friend was volunteering at CHAW and showed me around one day. I was amazed. A dark room? Dance studio? Kiln? Art Supplies? People spending their days thinking up ways to provide hands-on art experiences to us, the residents of the neighborhood? Unimaginable! I had one small child at that point, and I couldn’t wait for her to take advantage of all this RIGHT DOWN THE STREET! (I grew up in a small town in West Texas with very few such resources, which may account for some of my amazement). Forward to 2002, when another friend casually asked if I’d serve on CHAW’s board. I said yes, and since then I’ve been a board member, board president, full-time employee, part-time employee, consultant, audience member, and student. 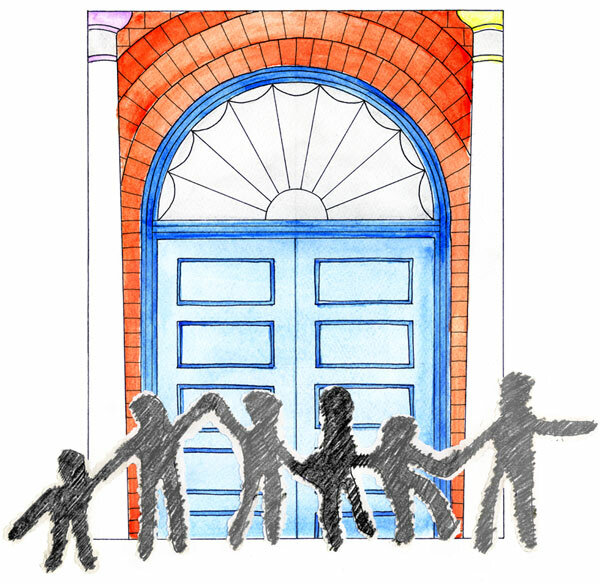 I took part in crafting CHAW’s mission statement, “Building Community through the Arts,” and helped shepherd a major basement renovation that provided more classroom and darkroom space. All three of my children, my husband, and myself have taken numerous classes at CHAW. You might say I have a stake in the place. And you’d be right. I wandered around the CHAW building a couple of weeks ago, snapping photos of things that I thought might help me describe what draws me to CHAW. Since I’m very visually oriented, I’m focusing on images–but keep in mind CHAW also has programs in vocal and instrumental music, dance, and theater. Those will have to be for another day. Every day is dinosaur day at CHAW! I saw this tableau in the corner of the art studio upstairs. A dinosaur who seems to be thinking, “dinosaur day.” A skeleton. A cardboard castle. Some objects I can’t identify. Something about this set up says all that is wonderful about CHAW to me. Perhaps it’s the unlikely juxtaposition of objects. The fact that the skeleton can’t help but look cheery next to those colorful dinosaurs. 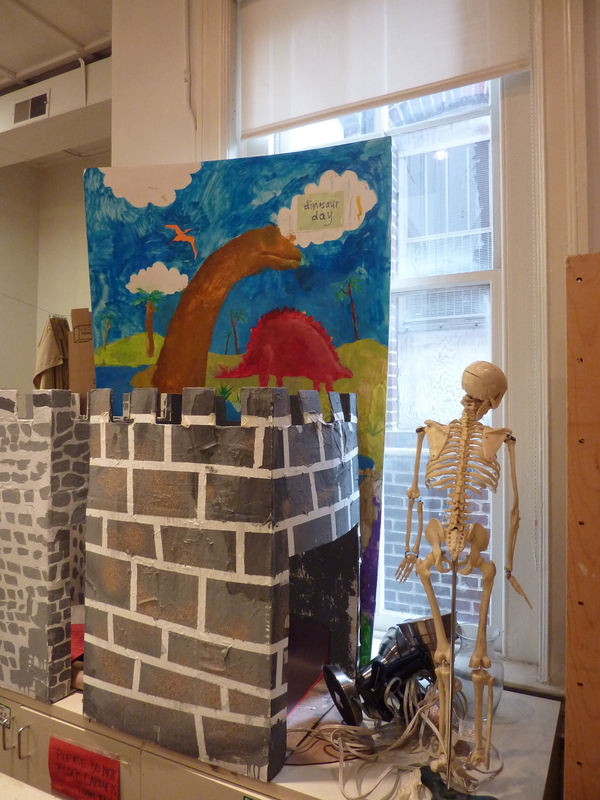 The way the dinosaur’s neck arches gracefully over the cardboard parapets of the exuberant little castle. There is something joyful about the whole thing, and CHAW is certainly full of creative joy. Across the room, hanging on a large bulletin board, were a number of drawings and watercolors from adult classes. "Winter" by Sandra Warren, winner of the 2011 Maureen Yonis Watercolor Award. 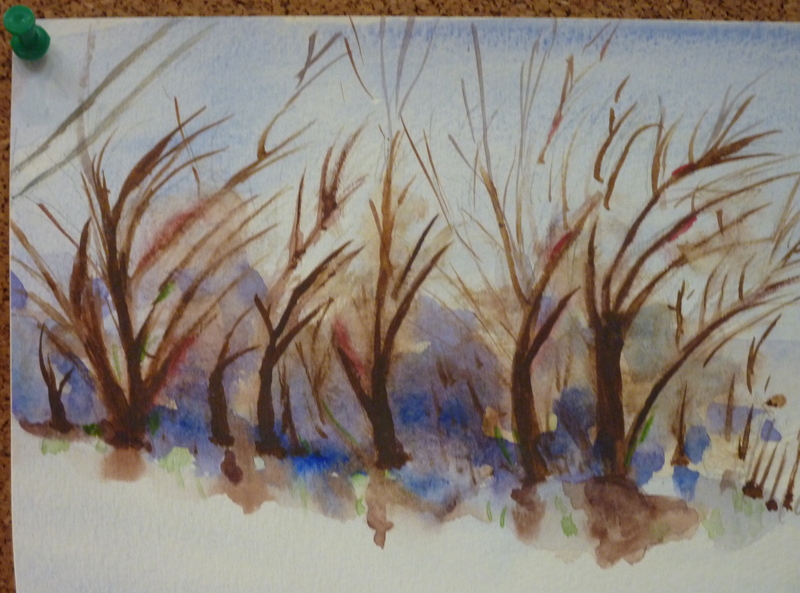 I love the delicate watercolor branches of these expressive trees, and the different perspectives on the model from the figure drawing class. Many of the adults in visual arts classes have very little experience in drawing or painting. Hard to believe from looking, right? But I think part of what brings out the creativity of adults is the relaxed and supportive atmosphere provided for the children at CHAW. It certainly carries over into the adult classes. Let’s say you go to Figure Drawing and you’ve NEVER ever done this before (been there!). You’re kind of putting yourself, and your pride, on the line. But who could remain nervous or uptight when a happy dinosaur and a skeleton are hanging out over in the corner? Near the main staircase hung an archival ink jet print by artist Mark Isaacson, called Every Photograph from the Website of a Major New York Newspaper, August 8, 2009. (One of many works of art for sale in CHAW’s art gallery). The image itself is a beautiful haze of soft color, indistinct, but humming under the surface. It suggests, to me, life in a city, in the world, in the 21st century when information is our fuel, beautiful but never-ending and often indistinct. The photo I snapped reflected–besides my poor photography skills–my own camera and CHAW’s main staircase. I started to delete it, but it struck me that the image offered a facet of CHAW’s meaning. There is the world, our world, with its sometimes overwhelming, impersonal flow of activity and information in the background. 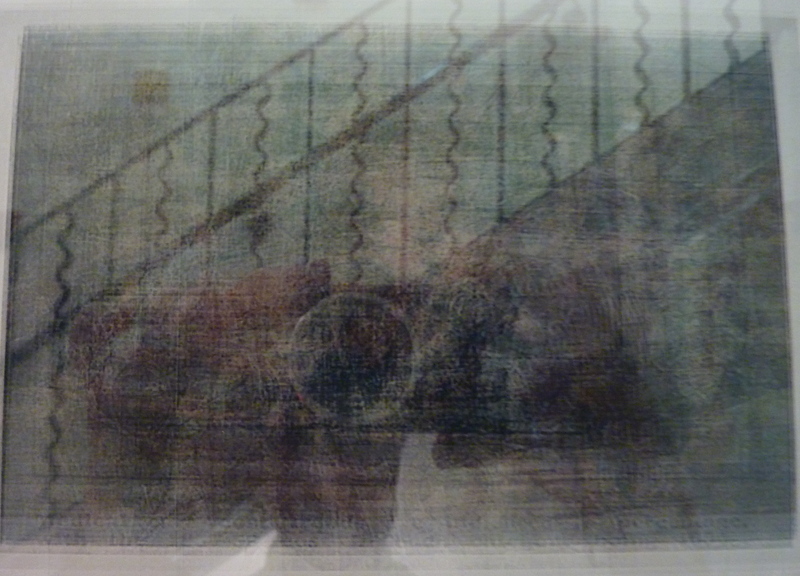 But superimposed, highlighted, are the distinctive squiggles of the CHAW staircase, the dynamic line of the railing moving infinitely upward, a camera drawing out the exact moment, and something new created. For me, that is what CHAW offers to anyone open to the experience–the chance to create, individually, but within a community of people looking for the possibilities in making something new in the world.